It's been a while since there's been a really spirited rush-hour protest against the behemoth buses carrying workers to and from tech campuses in Silicon Valley. But the tech shuttles have not gone away. Quite the opposite, in fact. 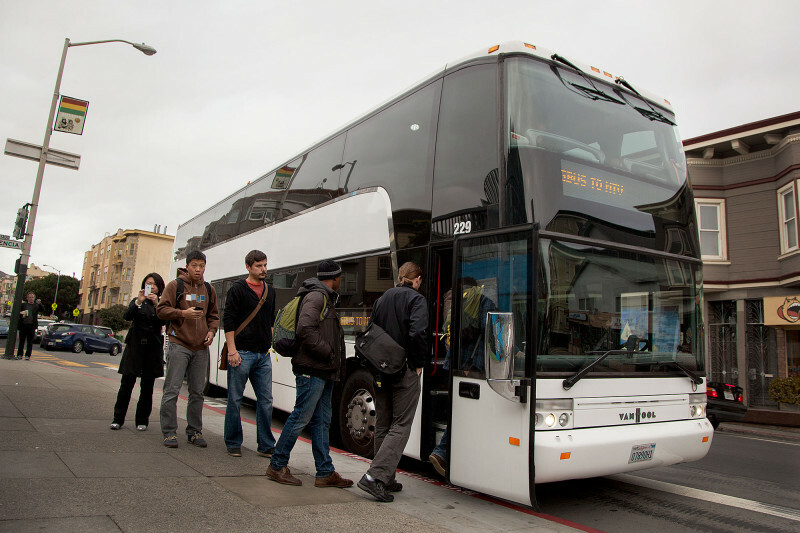 A new report from the San Francisco Municipal Transportation Agency suggests the private buses are busier than ever, with about 17,000 boardings every weekday. That's the equivalent of 8,500 round trips, about 75 percent of which involve workers traveling to Facebook, Google, Apple, Yahoo!, Genentech and other tech campuses. The number of individual stops the buses make to pick up or drop off passengers in the city -- about 3,000 a day -- has increased about 30 percent in the past year, the report says. The new SFMTA stats are part of a study evaluating the first year of a pilot program to try to bring some order to the expanding fleet of private shuttles and to deal with their impact on Muni buses, other traffic and pedestrians in the city. Among other requirements, the pilot program has required shuttle operators to use a network of 124 designated stops and to pay a fee of $3.67 every time a bus picks up or drops off passengers. The SFMTA says the network of stops is designed to prevent conflict with Muni vehicles and to give the private buses a way to get out of traffic when they make stops. The SFMTA report shows that so far, the pilot's results are mixed. Based on spot checks of shuttle activity at 20 different locations in July 2015, the SFMTA says the observed number of Muni buses blocked from making stops fell by 35 percent compared to June 2014. However, the study says that the shuttles, typically large motor coaches that carry 40 or more passengers, still have a way of obstructing the streets. The SFMTA spot check found the big buses blocked other traffic -- either other motor vehicles or bicycles -- on about 35 percent of their stops. At the worst locations -- Valencia and 24th streets, 16th and Mission streets, Lombard and Pierce streets, and Divisadero Street and Geary Boulevard, for instance -- private shuttle buses block other traffic virtually every time they stop to take on or discharge passengers. The study suggests that tougher traffic enforcement is needed to ensure shuttles don't double park and to ensure they avoid unauthorized use of Muni bus stops. In the first 10 months of the pilot, the report says, the SFMTA issued 1,200 citations to shuttle buses for those two offenses. "Double-parking is dangerous for everyone who walks, bikes and drives, resulting in unpredictable behavior by people trying to get around double-parked vehicles," said Chris Cassidy, communications director for the San Francisco Bike Coalition. The report also includes results of an SFMTA survey that included responses from 550 shuttle riders. Nearly half of those respondents said they'd drive alone in their cars if the shuttles weren't available. Based on that response, the SFMTA estimates the shuttles eliminate about 4.3 million vehicle miles traveled from the region's streets and highways. "The pilot program took cars off the road and created a situation where the shuttles could operate safely, as opposed to the kind of unregulated Wild West conditions that were out there before," said Tom Maguire, director of SFMTA's Sustainable Streets program, which produced the report. The pilot project is scheduled to run through the end of January 2016. Business groups support making the program permanent, but whether it becomes a fixture on city streets may depend on the outcome of a lawsuit filed last year by anti-eviction activists who say the private shuttle buses have fueled a rising tide of displacement in the city. The lawsuit seeks to require the city to review the pilot project under the California Environmental Quality Act, a review that must include an assessment of the project's impact on pedestrian and bicyclist safety, on air quality and on its "potential to displace low- and moderate-income individuals." Cynthia Crews, a self-described “transit geek,” is part of a group that has sued the city, seeking an environmental impact report on the shuttle program. But she doesn’t want to stop there. The city should also investigate the wear and tear shuttles are inflicting on the city’s roads and Muni’s bus stops as well as the effects on housing, she said. KQED's Amanda Font contributed to this post.